News: In preparation of either Molten strike / or accuracy cyclone version will come soon! means if something slightly changes it will be updated instanly. my Cyclone build. (2018 early 2019 physical version is posted below as well). Warning!! this is not a tutorial build for starters but an end game core build 95% original items that are on of a kind. abusing the power of acrobatics. life capacity is at 7854.
the small talentry changes will be aplied the soonest possible. Most of the gems are 21/23 from Incursion Temple of Atzoatl. No comments about this weapon, literly one of a kind in existance. The base damage speaks by itself. let alone the juicy hits cannot be evaded give u space create to the build and prevents the use of accuracy in many slots. and special thanks for all the help provide to finish the creation of this build. Evasion base absolutly important for the build. boosts the damage to the sky. The life prefixes are really important to keep our health bar high. +1 additional curse helps us to use 2 curses at once(from both rings). The power of abyssus helmet with no fear to use. 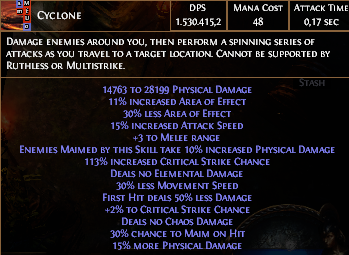 Almost perfect legacy one with 15% cyclone speed for even more damage. The whole itemzation of the build makes it safe to use 100%. Classic immortal combination nothing special about that. The best of the best by far melee gloves in the game. existing atm in the game. Enligten + Grace and Hatred to lower the mana reservation. 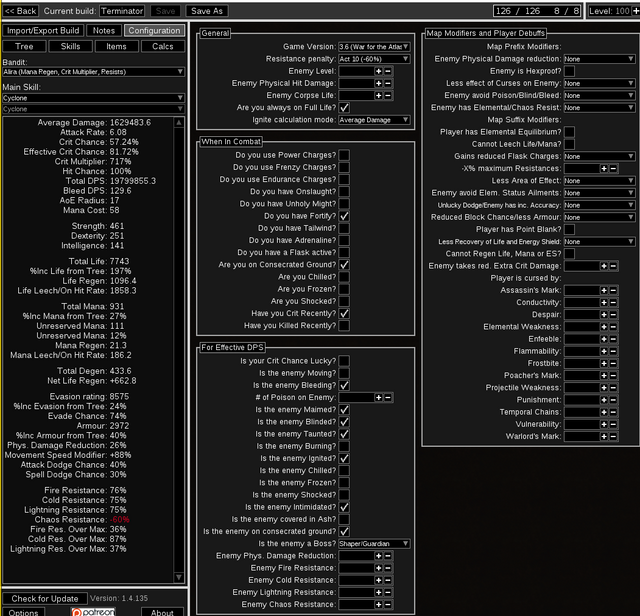 Trigger commndement of fury enchant has crucial part for the build. 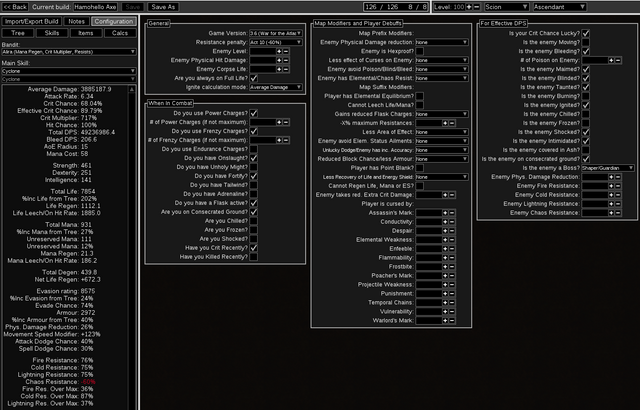 (more details to the proc dps senction). 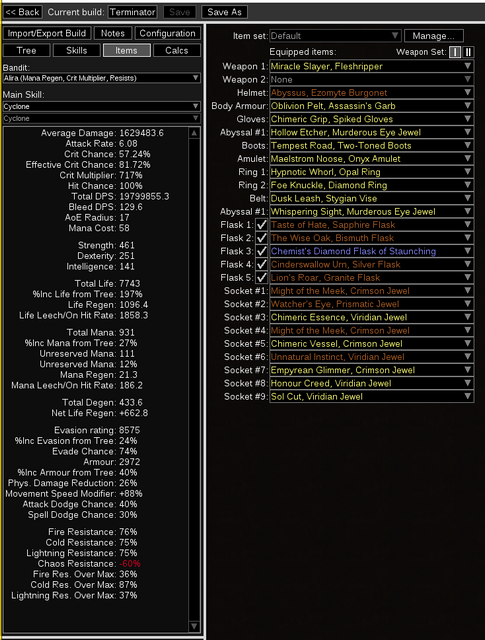 N1 life legacy implict 20/20 resistances + 10% penetra boots. Aggresive and defensive aproach at once. when we use our escape or intro ability the "godly leap slam". The Undisputed n1 dps melee leech belt in the game! Huge amounts of dps amulet that has potention in future to become even stronger. The n1 Assasin's mark + the n1 Warlord's mark rings together hits like a track. we can abuse the power of the pot and get the maximum results. the maximum benefit of 10% reduction to all elements. fire and lightning defenses when we press taste of hate. of recovery and alot of dps as well. might change to improve the multiplier). beeing afraid or having any problems at all. We had our convert to 100% cold to maximize the damage but then another idea came. (watcher's eye,skill tree,and glove veiled craft). We divined the Watcher's Eye to lower % of cold conversion. 18% MORE cold damage ). any ailments due to using elemental focus inside our main 7 link cyclone. marvelous options for the build u can do it easily. 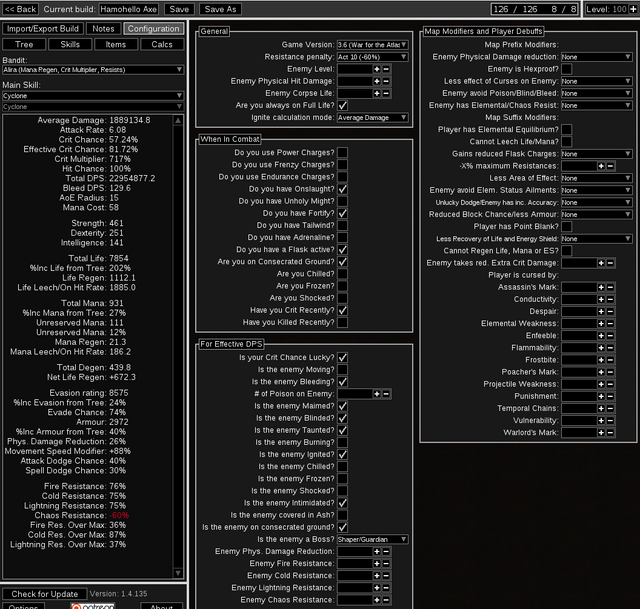 By adding phase run proc damage if i get hit the damage skyrockets at 28,6M. from frostbomb cause i dont know if the system applies it or not. (My friend,Co crafter and supporter to everything i ever dreamed for the game. My friend, guild master, and supporter in every possible way. My friend,and supporter to everything i asked till now. so we dont do any mistakes according the build creation. on Oskarm all at once from +1 curse from Chest and +1 curse from amulet. Following with Grace,Banner and Cat's Stealth from the belt. Charisma and went even more aggressive to True Strike. In total of 3 curses,1 aura,1 buff(aspect) and the banner all at once!! I can honestly use on this build 5 curse at once!! Sadly i will loose a lot of damage due to that but ill test that as well. Consider to place a mana leech talentry to avoid mana returns. I prefer the + 2 free skill points, it allows me access to everything i desire. The rest choices are also really good especially Lord Alira. For mapping, i prefer to use as major Soul of Lunaris and minor Soul of Garukhan. At the moment, am using Raider and finish the root Path of the ranger to allocate. My second choice is Assasin. physical reflection, or Juggernaut if u feel u need the extra accuracy. I’ve watched the formation of this build lately and I know how much torment it brought to its creator, now that the journey has been made, I congratulate you bro don't stop there! Congratulations on completing the build! It would be nice to watch the video with this build! Holy Cow, after 6 months finally i see a slight better Bron than mine gz bro. improve it even more and constantly testing and experimenting. Truly outstanding, one of a kind build. so few builds ever get to this level of min max. you should be proud. Huge grats on the level 100 as well. Thanks man, so many projects pop up and i burned my mind and now am working slowly. If the thread goes good as i expecting ill post insane things to watch. ty so much, it means alot to me. The lvl 100 part was painful but finally its done i feel so relief.